Finally since the tremendous success of Down To The Bone at their US-tour Smooth Acid Jazz is a known music genre even in USA. We start our journey into Smooth Acid Jazz with some definitions of this term. Acid Jazz is a conglomerate of many music styles like jazz, funk, salsa, Brazilian music, hip hop, dance and the sounds of Africa. "The only thing which held the whole thing together was a recognition of what it was not. It was not house, nor was it indie and that was about it. If you could dance to it and it had sincerity, that was enough." Acid Jazz is definetely a groovy music and dancable. No wonder the roots of this genre are to find in London's dance clubs and Ibiza's discos. Acid Jazz kicks the funky beat. A lot of explanations of Acid Jazz are collected at the well-assorted Acid Jazz website under the topic FAQ. Acid Jazz started in UK, while the roots are captured by the fog of history. 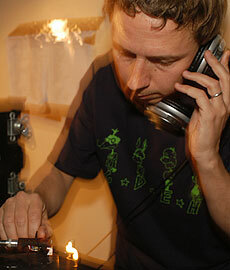 The person of Gilles Peterson is certainly closely associated with Acid Jazz. ".... jokingly giving James Taylor a cassette of Funk Inc. and Charlie Earland Grooves labelled simply "Acid Jazz" in order to inspire him"
"....a friend of mine had just come back from Spain and had brought some acid house records with him which he announced were the latest thing. But the dancefloorstayed empty. Then it was my turn and I put on a few jazz pieces. The dancefloor was full. To take the piss out of him I called my music acid jazz.."
Certainly was the word "Acid" as a prefix an irresistible attraction for the youth in these dance clubs, which were faced with this mixtures of modern African based rhythms and classical jazz tunes. Acid Jazz had even a certain importance for the revival of straight ahead jazz. The Jazz Dance Scene - an innovative and creative movement or plagiarism disguised? by Andrew Penny. Readers of my earlier reviews will already be familiar with the term Smooth Jazz. Those who need some more informations, can read my collection of definitions under the topic "What is Smooth Jazz?". But let's approach the term Smooth Acid Jazz now.